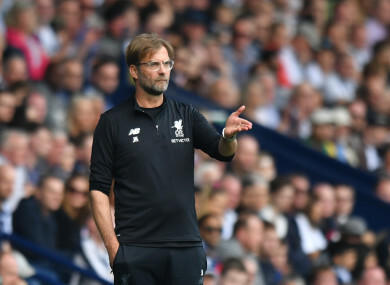 JURGEN KLOPP BLAMED West Bromwich Albion’s failure to water the Hawthorns pitch for the late collapse Liverpool suffered in their 2-2 draw on Saturday. Klopp’s side took a two-goal lead thanks to strikes from Danny Ings and Mohamed Salah, but they were rocked by Albion’s dramatic fightback. Jake Livermore got one back with 11 minutes left before Salomon Rondon equalised in the 88th minute. It was a frustrating warm-up for next week’s Champions League semi-final first leg against Roma and seemed to put Klopp in a bad mood. The Reds boss expressed disappointment with Albion’s decision not to water their pitch, bemoaned referee Stuart Atwell’s refusal to send off Ahmed Hegazi for appearing to punch Ings and claimed Liverpool should have had a penalty. “It was a difficult game as the pitch got drier and drier. West Brom decided not to water the pitch at half-time and that makes it difficult,” Klopp groaned. On Ings’ penalty appeal, Klopp said: “People laugh at Ings when he goes down, but I don’t know anyone who doesn’t go down in that situation. Email “Klopp: 'West Brom decided not to water the pitch at half-time and that makes it difficult'”. Feedback on “Klopp: 'West Brom decided not to water the pitch at half-time and that makes it difficult'”.